Order your Parker Ballpoint Pen Refill today from FahrneysPens.com. Fine Pens, Refills & Luxurious Gifts – great prices & fast shipping. 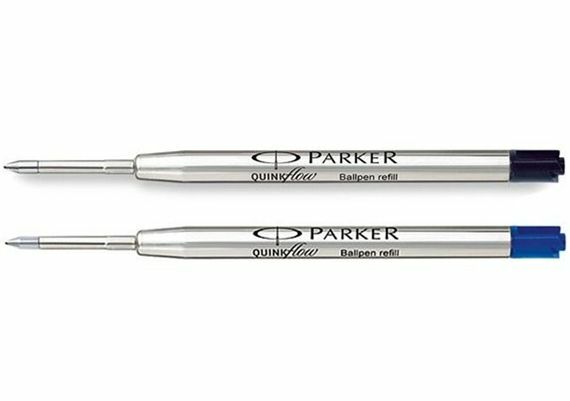 The Parker Ballpoint Pen Refill is formulated for superior execution and offer optimal performance with no blockages. You will be able to write on virtually any paper effortlessly. The Parker ballpen refill is available in multiple colors and point sizes. I recently needed a refill for my older Parker pen. I ordered a Blue refill with a Medium end. This refill has the most vibrant, beautiful blue ink I have ever seen. I have always loved writing with my Parker pen, but now I look forward to using it. If you are in need of a Parker refill, do not hesitate to order this one. You will NOT be disappointed! Compared to Pelikan, Schmidt, Dupont, Waterman. In my opinion, the Parker refill writes the most smoothly and delivers the most intense black line compared to all the above. I have made the longest comparison (day) with Pelikan's refills, and the least intense comparison (minutes) with Dupont's.